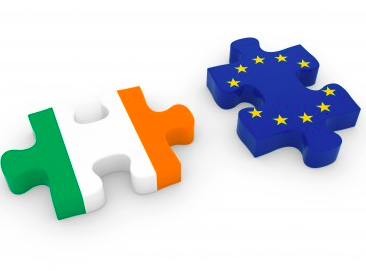 Does the EU love Ireland? Anybody? Anybody? OK, I’ll tell you. It was Theresa May. Speaking, of course, before the Leavers won the referendum and before she became British prime minister. Now she is or has to be as firm and committed, and produce arguments for Leaving, the way she did the opposite during the Brexit referendum campaign. So maybe we shouldn’t be surprised when she brings back to London a withdrawal deal and says it is the best possible deal for Britain and the alternative is no deal, and then turns round and votes against her own deal. Back in the bad old days they used to say it was a woman’s privilege to change her mind. Theresa May has carried that notion to a level (or depth) beyond normal human experience. March this year looks like it’ll come in like a lion and go out like a flesh-eating tyrannosaurus rex. We can take it as read that Theresa May’s latest foray to Brussels will produce nothing of substance; so the question is, who will blink first, Britain or the EU? Sammy Wilson and Rees-Mogg and the others are convinced it’ll be the EU – sure don’t they always do their last-minute concessions at 30 seconds to midnight? And there’s some truth in this, too. Clever negotiators must give the impression that they can live without agreement, in the hope that the opposition will then decide to pull its horns in and settle. That is indeed the EU way. Except there’s one little difference this time. In those cases of 30-seconds-to-midnight concessions, the EU was negotiating within itself: it was trying to reach an agreement among EU members. In this case, the EU v the UK case, the EU is negotiating (or has negotiated) with a state that will be outside the EU. Check again those figures above, straight from Theresa May’s own rosebud lips: 44% at jeopardy for Britain in trading with the EU, 8% at jeopardy for the EU in trading with Britain. Who stands to lose more? You’ll get people who will tell you that the EU is ruthless, that, if it’s faced with a choice between throwing the south of Ireland under the wheels of a juggernaut and getting a deal with UK that’ll be mutually beneficial, the EU will sacrifice the south of Ireland. The catch with that line is that it’s not the south of Ireland the EU would be jostling into the path of that juggernaut – it’s the EU itself. The EU isn’t maintaining its hard-eyed stare because it loves the south of Ireland: it’s maintaining its unblinking-stare because it loves the EU – loves itself. Not only is it keen to maintain peace in Ireland, it wants to make sure that the single European market stays intact. Were it to sacrifice the south of Ireland, it would be taking a wrecking ball to the whole notion of the single market. The border between the south of Ireland and the north is the border between the EU and the UK. Final point. There are some people who are either very silly or very devious urging Sinn Féin to take their seats in Westminster – that their vote could change the history of Europe, help avoid a UK crash-out. People who push this advice are very bad at Mathematics and very bad at history. Bad at Maths because, as Mary Lou MacDonald pointed out on the Andrew Marr Show on Sunday, the Scots Nats have a lot more MPs in Westminster, but it hasn’t made a blind bit of difference to England’s blithe lack of concern about what Scotland wants and needs. Going back a century, the Westminster parliament made a monkey of Ireland when it took John Redmond and his fellow-MPs for a lethal ride, promising that Home Rule would be theirs if they got in there on Britain’s side in the 1914-18 war. Needless to say, Home Rule never happened. Westminster doesn’t really give a damn about Wales, Scotland, the north of Ireland or the south of Ireland. Never has, never will. The difference this time is, those countries are beginning to cop on and are determined to look out for their own interests. In the words of The Who way back when: Won’t Be Fooled Again.